Using the highest quality materials and prefabricated under the best manufacturing conditions and trade practices in Korea, the new innovative Acoustic LuxFeel features a 2mm Acoustic Underlay factory dual bonded to a 3mm LuxFeel Loose Lay plank. Our super resilient PU coating provides ease of maintenance and care. The 0.5mm wear layer is class leading and commercially rated. There is no need for additional materials and extra labor with the 2 in 1 Acoustic LuxFeel loose lay planks, saving you valuable time and money through speed of installation. All you need is a clean, smooth substrate and a simple environmentally friendly PS tack-off adhesive system for speed of installation. The Anti Bacterial Nano Silver Coating makes Acoustic Flooring a safe, warm and cozy flooring option for every family member or pet. Perfect for any project – residential and commercial like healthcare and education. Acoustic LuxFeel is perfect for High Rises, Offices, Multi Story Homes, or Commercial Projects featuring a white visible built in underlay, exceeding the Australian ISO standard requirements for impact sound insulation. 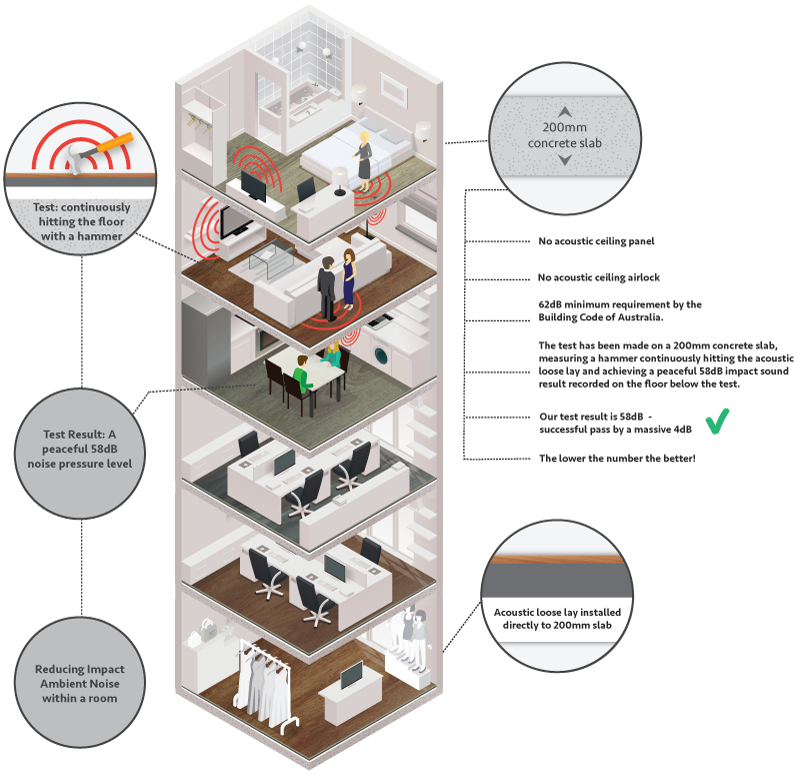 Acoustic LuxFeel is also suitable for ground floor properties, as it reduces the impact sound within a room, this way it absorbs some of the ambient sound caused by the impacts. 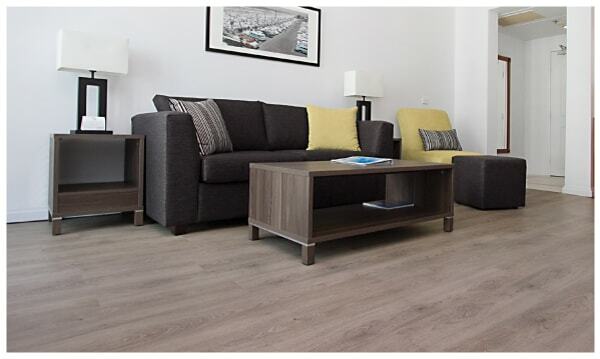 Acoustic LuxFeel loose lay planks are waterproof. Each plank has a minimalist grain, giving it an authentic look. Looks like you’re walking on real timber, but feels like you’re walking on clouds. Any flooring system that has impact sound reduction qualities, has the effect of lowering the impact sound in nearby rooms or lower floor level rooms. The Acoustic LuxFeel Loose Lay from Acoustic Flooring, features a 2mm Acoustic Underlay that reduces the impact sound. Acoustic LuxFeel Loose Lay has performed an impact sound reduction test in Australia in a new high rise development, on a 200mm concrete slab. 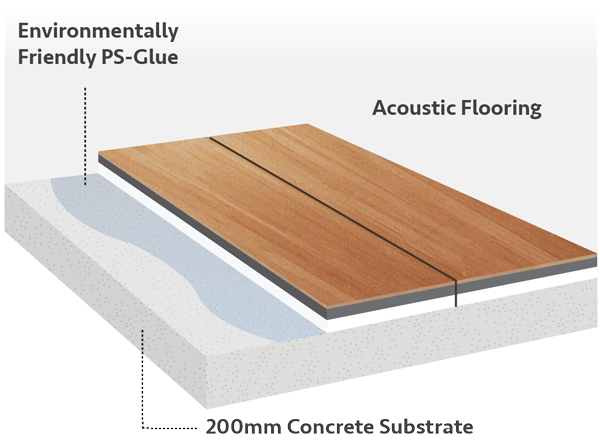 The flooring was secured with a Water Based Pressure Sensitive Adhesive to the 200mm concrete slab and was performed in conformance with ISO 140/7 “Field measurement of impact sound insulation of floors.” The levels of the ambient sound were measured before and after the testing with the result of a 58dB impact sound reduction, which surpasses the Australian Building Code requirements of “under 62dB”. This is a reduction of 10dB compared to the bare 200mm concrete slab which achieved a 68dB reading. This is used to test the abrasive resistance of solid materials such as metals, composites, ceramics, and thick coatings. This test determines the wear and tear and durability of the flooring, by placing it under classification groups from T to F.
Acoustic LuxFeel Loose Lay satisfies the requirements for class T according to EN660-2, which is the highest abrasion group. The dimension of change and stability according to EN 434 is any change in a material’s original dimension as a result of exposure to variable weather conditions – heat or cold, while being used for its purpose. 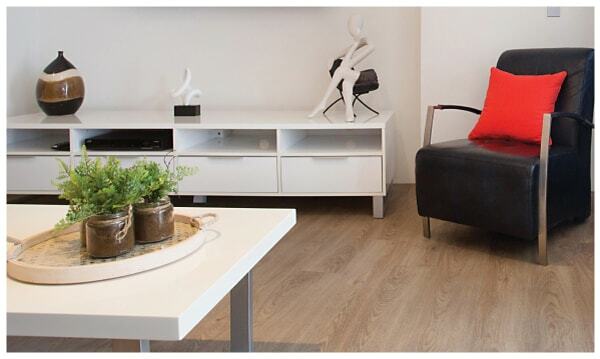 The lower the dimensional change in a flooring will prevent gaps from occurring, and this is tested under ISO 23999. Acoustic LuxFeel Loose Lay passes the ability for the plank to maintain its shape during its lifetime wear in variable weather conditions. Fire behaviours according to AS ISO9239.1-2003 represent the reaction of floor coverings in a fire. Suitable for use in Class 23 heavy duty domestic and Class 33 heavy duty commercial areas. The Wet Pendulum test determines the slip class rating of flooring under a wide range of conditions. The Australian requirements are currently worldwide the best standards for pedestrian wet slip resistance. The Acoustic LuxFeel Loose Lay planks have a R10 slip rating – which means they are suitable for most commercial applications, except for a commercial kitchen. They pass the latest Australian slip test standard – AS4586-2013. Acoustic LuxFeel has a P4 test result – it is in class W, which means the risk of slipping when wet is low. The resistance to chemicals and stains can be determined by the ISO 26987 standard, and describes the evaluation of materials exposed to different chemicals. The clearer the residue is seen, the higher the numerical value of the category. Acoustic LuxFeel Loose Lay has a great resistance to a number of chemicals or stains, passing the Standards EN 423 and ASTM F-925. Please note Acoustic Flooring is not resistant to acid solutions or other harsh chemicals. Acoustic Flooring passes the measurement of ISO 105-2 comparing the rate of fade against a scale of 1-8, respectively indicating weak resistance to fading (1) to strong resistance to fading (8), Accoustic Flooring is classified as above grade 6. The specifications under the Australian Standard ISO 9239.1-2003 determine the requirements in relation to the fire hazard of floor coverings. The test determines the reaction of to fire and the burning behavior when the floor covering is exposed to a radiant heat source. This is used to determine the Critical Heat/Radiant Flux (CHF) value, the smoke value and blistering. The Critical Heat Flux result for Acoustic LuxFeel Loose Lay is 7.0kW/m2. The higher the better value, and it must not be less than approximately 4.5 kW/m2 depending on the building class.